With management stints in Charlotte, Philadelphia, Lancaster, and New York, Andy knows advertising, marketing and media sales. 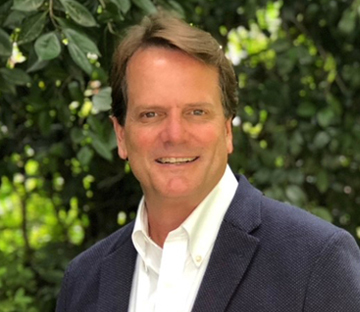 He’s served as local and national sales manager with the Hearst, Paramount, Capitol and Nexstar broadcasting group’s stations including WSFX, WYOU, WGAL, WSPG, and WJZY. Through all the changes in the industry, what he’s loved most about the business is helping his clients succeed. Reaching the right customer, with the right message, at the right price has always been a formula that works. In 2018, Andy joined Colonial Marketing. Owner, Rod Flinchum, was one of Andy’s first friends when he relocated to the Wilmington market in 2014, and he was immediately impressed by the depth and breadth of services Colonial brought to its clients. Andy is thrilled to join forces with this cutting-edge agency to expand the options and capabilities he can bring to his clients. Andy loves helping business owners share their story. He’s helped hundreds of small businesses fine-tune their messaging to connect with their ideal customers and establish their brand in the marketplace. With his experience sitting on both sides of the bargaining table, Andy is also a media buying expert. He can help you reach the most customers with the most frequency – at a cost well below what is expected. By finding pockets of opportunity in this complex media landscape, he can stretch your marketing budget, and give you more for your money. But what’s most important to Andy, is his relationships – with his clients, his vendors and the community at large. He treats his customers like family and the results speak for themselves. A devoted family man himself, Andy couldn’t be prouder of his three grown sons, Taylor, 24, Drew, 20 and Owen, 18, and his wife, Wendy, of 27 years. Let Andy be your marketing arm and take your growing business to the next level. He can guide you through what works (and what doesn’t) in this ever-changing complex market.